Most people trying to lose weight tend to skip breakfast, thinking it will help them. However not many know that on the contrary, the first day of the meal can help with weight loss. Read on to learn about the ideal breakup of the typical food categories in your breakfast. 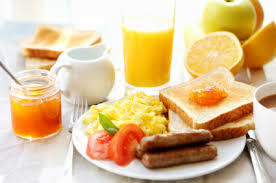 The following tips will prove how a scrumptious, filling and well balanced breakfast can actually help you lose weight. Have a breakfast ranging between 300 and 400 calories. Typically, you should stick to 300 to 350 calories if you are trying to lose weight and if you want to just maintain your weight and you work out, then opt for something closer to 300 and 400 calories. Make sure 45 to 55% of your breakfast comprises of carbs, about 40 to 55 grams of carbs. Avoid eating overly processed and sweet foods, or foods made using enriched white flour. Instead, eat more of veggies, fruits and whole grains. A healthy breakfast is one comprising of 15 to 20% protein or 13 to 20 grams of protein. It is important you get sufficient proteins in the morning to keep you satisfied. Moreover, studies prove that including at least 20 gems of protein in your breakfast helps you lose weight. Examples of some great sources of protein are eggs, protein powder, soy milk, nuts, seeds, smoothies and whole grains. Try to eat only 10 to 15 grams of fats during breakfast, as it constitutes about 30 to 35% of your total breakfast calories. However instead of eating saturated fats like bacon and cheese, the monounsaturated fats (MUFAs) like olive oil, seeds and nuts and their butters, and avocado are better fat options. Aim to include about 6 grams of fiber or 25% of your recommended daily total of 25 grams to your breakfast. Of course, it’s okay if you consume more, as long as it does not trouble your digestive system. Some examples of fiber rich food are seeds, greens, apples, berries, pears, greens, nuts and whole grains which effectively help you meet your goal. If you have as much carbs as mentioned above, then you are assured you don’t have too much sugar in your meal. This is especially if your breakfast comprises of a healthy combination of foods like whole grains, dairy products and fruits. However for reference, you should stick to only 36 grams or fewer of sugars in your meal. Regarding added sugars, it’s better if you can restrict your consumption to only six grams, which is about 1.5 tsp. of any sweetener like honey, maple syrup, white sugar, brown sugar and agave. Besides the perfect breakfast, it’s important that you eat your breakfast within half an hour to an hour of your waking up. Supposing you find it difficult eating something big first thing, you could perhaps split your breakfast into two parts. You thus have something light when you get up, and have the other half of the meal about one and a half hours later. This suggestion is best if you are a morning exerciser and don’t like working out on a full stomach. Moreover, if you work out in the morning, its better having the carbohydrate portion of the meal before working out and the protein-centric portion later on.